James East Tomlinson, age 60, passed away peacefully at his home in Avon Park, Florida surrounded by his family on Friday, Jan. 19, 2018 after courageously battling melanoma for over three years. Also known as “Jamie,” “Tom,” and his favorite name of all, “PawPaw,” he is deeply loved and will forever be missed by his surviving family, wife of 37 years, Andrea; faithful dog, MoMo; son, Brock Tomlinson (Cary); daughter, Casandra “Casey” Tomlinson-Markward (Robert); grandchildren, Bryson, Kyleigh, Grady, Easton, and Dixxon; sister, Thea Lyons (Bill); and brothers, Tommy and Steven Tomlinson. James was born to James L. Tomlinson and Carolyn J. Tomlinson Thullbery on June 14, 1957 in Avon Park, where he remained until after graduation from Avon Park High School. James joined the United States Army in 1976. During his 20 years of service James graduated college at the top of his class, became an instructor helicopter pilot, and retired as Chief Warrant Officer 3 James E. Tomlinson in 1996. In 2012, James and Andrea moved ‘home’ to Avon Park from Fredericksburg, Virginia. James was an avid fan of the Miami Hurricanes, enjoyed hunting, fishing, horse racing, tailgating, and spending time with his beloved grandchildren. 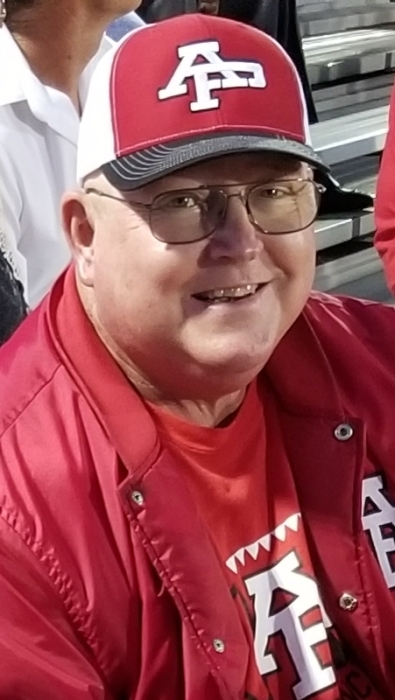 A simple man with an abundance of hometown pride, he could usually be found in the stands at APHS Red Devil football and baseball games, enjoying the sport, the company, a cheeseburger, and a Coke. James is preceded in death by his hound dog, Cane; parents, grandparents Jimmy and Louise Tomlinson and Noah and Mildred East; and uncles, Billy and Bob Tomlinson. The family will accept visitors on Wednesday from 5-7 p.m. at Fountain Funeral Home in Avon Park. Services will be held at First United Methodist Church of Avon Park at 6 p.m. Thursday, Jan. 25, with a dinner reception to follow in the fellowship hall.. A private burial will be held on Friday. Memorial contributions may be made in the name of James E. Tomlinson to the Avon Park High School Athletic Department, 700 E. Main St., Avon Park, FL 33825 with attention to Whit Cornell.